Many believe that "You get what you measure." The belief persists, in part, because of anecdotal evidence; because some experiments do appear to be consistent with the assertion; and because so many of us believe that the rest of us believe it. 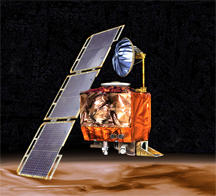 The Mars Climate Orbiter, as it would have appeared if it had not been lost upon entry into Mars orbit. Mars Climate Orbiter was lost because of a mismatch between Metric and English units in a file used by its trajectory models. The measurements were all objective, and they were even precise, but confusion led to a loss of the orbiter. Photo courtesy U.S. National Aeronautics and Space Administration. Still, there are reasons to question its validity. What follows is a catalog of possible explanations for variances between the promise and the reality of metrics-based management. In this Part I, we examine three assumptions underlying the measurement process. See Part II and Part III for more. Sometimes we try to measure attributes that aren't directly measurable. For instance, when we try to measure immeasurables like loyalty or initiative, we actually measure something else that we assume is highly correlated with what we're trying to measure. We usually do this using interviews or surveys. But too often, rigorous proof of the assumed correlation is unavailable. Sometimes, we comfort ourselves, saying, "it's so obvious," but this is risky — the history of management, psychology, and science is replete with assumptions that, though obvious, were nonetheless false. The word "measurement" evokes our experiences determining physical attributes like length, weight, or temperature. This leads us to assume that whatever we want to know can be determined by a suitable measurement, but that assumption can lead to trouble. Consider something as important as progress. Suppose a team has been working for three weeks, when, suddenly, someone realizes that their entire approach will never work. This is certainly progress — they've learned something important. But it probably won't register as progress in the organization's metrics. Most likely, it will be reported as a setback. attributes are measurableattributes, such as the advance of knowledge, is often possible when changes are incremental. But at times, our metrics fail, and they tend to fail precisely when we most want to know where we stand. Sometimes we use measures that are objective but imprecise. That is, we assume wrongly that multiple identical measurements would yield nearly identical results. For instance, when we measure attitudes using a survey "instrument," we assume that the results we obtain are relatively context-independent. We don't actually know that the results are independent of, say, the time of the month, or the price of the company's shares — we just assume it. Rarely do we test these assumptions. Indeed, we often assume that these factors do affect the results. We know this because we sometimes observe organizations gaming the measurement for favorable results, or trying to influence the results by releasing favorable news. Would you like to see your comments posted here? rbrenvbvLDjIGDoNFlLblner@ChacCRKFOSgIonGlqrApoCanyon.comSend me your comments by email, or by Web form. I offer email and telephone coaching at both corporate and individual rates. Contact Rick for details at rbrenEdTpQWPiTWDyWbJsner@ChacpIOossiYjOnPEoSFoCanyon.com or (650) 787-6475, or toll-free in the continental US at (866) 378-5470.